You are now, and always will be, a child of the Sacred Heart and a beloved member of our Sacred Heart family here at Convent & Stuart Hall. Our goal is to help you stay connected to the school and to one another, while honoring the history of the school by preserving the legacy for future generations. Through the Convent & Stuart Hall Alumni Association you will not only stay connected to fellow classmates and the school but you are also given access to the powerful network of other Sacred Heart Alumni. Through different events and programs each year, social networking channels, printed and electronic communication as well as participation in the Annual Fund and other critical campaigns, there are many opportunities for you to make a difference at Convent & Stuart Hall. The Convent & Stuart Hall Alumni Council works to nurture and strengthen relationships between the Schools of the Sacred Heart and its Alumni. The Council seeks to enhance the experience of both Alumni and current students. The Alumni Association keeps Alumni connected to the mission of Sacred Heart Education, Convent & Stuart Hall and each other. In conjunction with the school administration, the Council looks to identify and develop programs that speak to the needs of the Alumni community. With more than 7,000 alumni worldwide, the Convent & Stuart Hall Alumni Association reflects the enduring legacy of the school, the relevance of the values and principles espoused by founder St. Madeleine Sophie and the powerful impact of a Sacred Heart education on generations of students. Retirement party 2017: The school community celebrates Marisa Orso, Carol O'Malley and Glen Bowers for a combined 93 years of service to Convent & Stuart Hall. The Stuart Hall house band serenades the retirees. 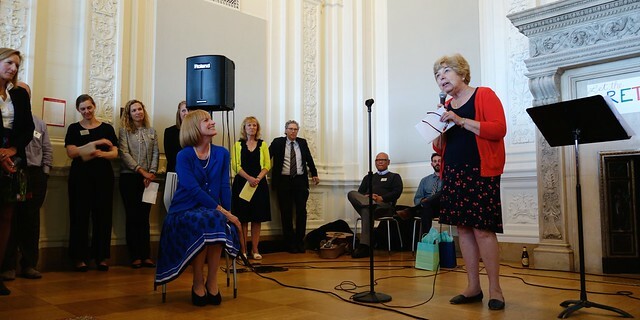 Colleagues honor retiring faculty members with poetry.